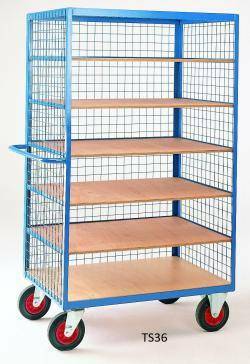 These steel open shelf trucks are a great and flexible storage system which can be modified to suit your individual needs. A fully welded steel construction and the range boasts a massive 500Kg Capacity. All units are supplied with steel Mesh inserts on 3 sides for peace of mind when loaded. An optional padlockable door front for security is available and a handy draw bar handle for ease of movement . 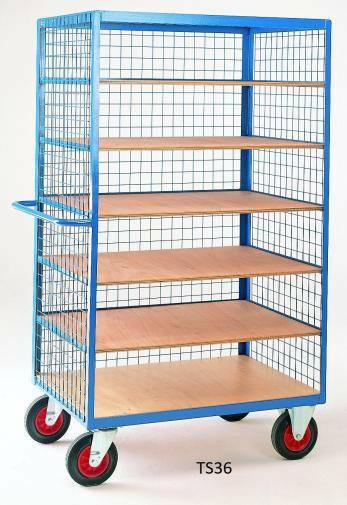 All units have fixed plywood platform with 5 drop in plywood shelves spaced at 250mm centres from 525 to 1525mm with a lower platform height of 275mm. The units are easily maoeuvrable with a comfortable grabrail and 4 x swivel 200mm rubber castors(2 x Swivel , 2x Fixed ). This unit is attractively finished in Blue Epoxy Powder.